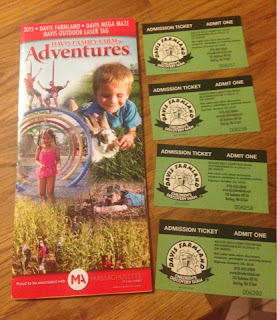 Dollops of Diane: Davis Farmland: Ticket Giveaway! I recently received 4 tickets to Davis Farmland in Sterling, MA. Our family has never been so I was pretty excited to go. I have heard nothing but great things about it and heard over and over again that it is well worth the money since you can easily spend the whole day there. I envisioned a good old fashioned, animal and pumpkin filled family day. However, life and other commitments have made that plan dwindle and now I fear we won't make it before Davis Farmland closes for the season. What does this mean for you? Well it means YOU could go and have all the family fun that I imagined! That's right - I am giving away my family 4 pack of tickets to one lucky Dollops reader! If you're unfamiliar with Davis Farmland, click HERE to check out fellow blogger, Gilda's, recent post about her family's trip there. It's filled with information, tips, and pictures! The tickets expire on October 25, 2015 so this is a QUICK giveaway. Enter now so I can pick a winner and mail the tickets out to the lucky duck!